Welcome to Turf Growers Blog, you will find loads of useful information on lawn care, turfing tips and the latest news and updates on subject that may affect your turf like hose pipe bans and weather conditions. If your lawn has suffered over the summer, and has some bare patches, maybe under a tree, or where the children have been playing, you will need to repair them. But what is the best way, seed or turf? Apparently some people reseed their whole lawn every year. And certainly doing so could avoid a range of problems, including different coloured patches. It also re-establishes your original mix, and prevents the coarser grasses out-competing the finer ones and taking over. But even if you don’t really want to bother with that, and just want to repair one patch, then seeding can still work quite well. There are a range of different seed mixes available, so try to buy one to suit the patch. For instance, if it’s right in the middle of your children’s football pitch, you’ll need a hard-wearing mix! If under a tree, try to find a shade-tolerant one. Once you’ve got your seeds, you need to cut out the old turf, using a half-moon edging tool if you have one. Use a fork to loosen the ground below, and add some top soil or potting compost to give your seeds something to grow in, and bring the level up a bit closer to that of the rest of the lawn. Sprinkle over the seeds according to the packet instructions. Cover with more topsoil, and water in with a sprinkler or fine rose. You’ll probably need to cover the seeded area with a net to keep off birds, pets and children. And do keep the net on until the grass has really started to grow! A suitable alternative to seeding is to re-turf the patch. You can buy good quality turf from turf suppliers, and it is available in quite small quantities for patching. If you know what lawn turf was used originally, you can try to buy the same type, so that you won’t end up with differently-coloured patches. 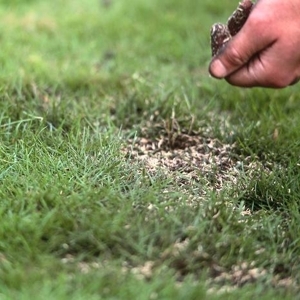 As with the seeds, you need to cut out the worn area of turf, and loosen the soil underneath with a fork. Cut an identically-sized piece of turf from your new turf – use the old piece as a template if you can – and place it into the space left behind. Top-dress with lawn sand, filling in any gaps around the edge of the turf. Press down the edges gently with your foot to secure it in place, and water in. Try to avoid walking on it for a few days, to give it a chance to root, but you don’t need to leave it quite as long as with seeds. So you see, to seed or to turf is the question, but the answer is up to you.